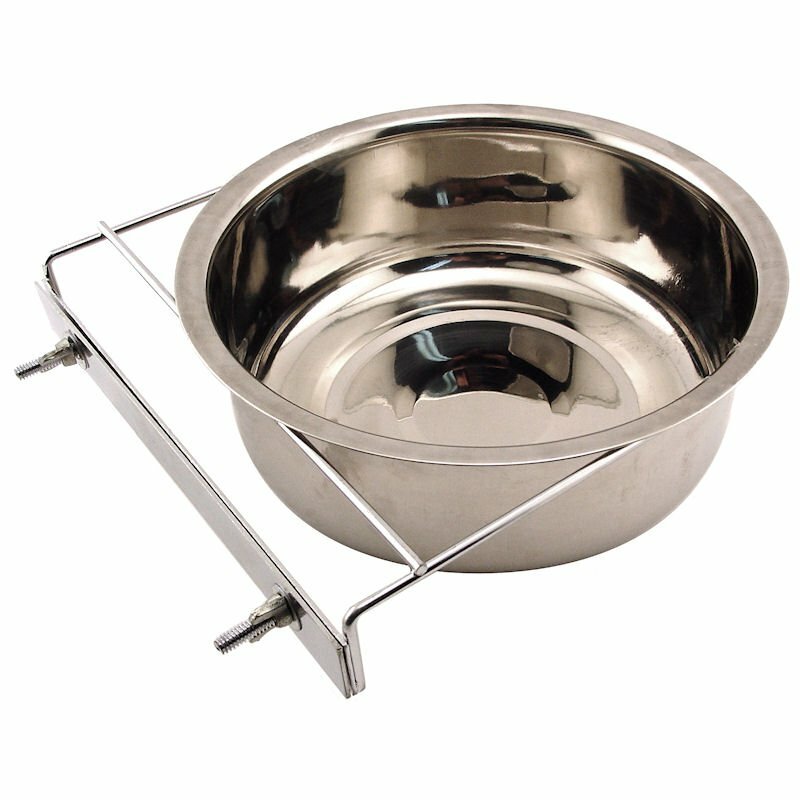 Large Stainless Steel Kennel Cup with Bolt Clamp -- approx 88 oz.. $13.95. "This is a great product." This is a great product. I love the versatility of it as you can set it at the appropriate height for each dog. "I permanently mount these to a wall. I have critters that love to knock water bowls over. These don't move." I permanently mount these to a wall. I have critters that love to knock water bowls over. These don't move. "I absolutely love the dog bowls!" I absolutely love the dog bowls! They are the best size, and they are ideal for my dog who chews up everything. I wish I could rate higher than five stars. The customer service and shipping were excellent too. Very sturdy and versatile. I purchased several for use in my dog trailer as well as crates and kennels. The bowls worked for all applications and hold up well to my very high drive dogs - who are not easy on anything. The clamps would not work on my dog trailer bars but due to the way they are engineered - with the welded back plate with fixed screws and removable from plates - I was able to drill and mount the bowls directly on the interior walls and they work great. Excellent, high quality product at a great price. And the personalized service will bring me back! Thank you so much. Installs easily in crate, and big enough to hold sufficient water for our Golden. "I would like for the mounting brackets to be a little stronger." I would like for the mounting brackets to be a little stronger. My eighty pound Lab has on occasion bent the bracket. Other than that, the water bowls are good. They hold water. Keeps from being upset by puppies. Works very well. "Had to reinforce it. Water was too heavy and caused it to lean." Had to reinforce it. Water was too heavy and caused it to lean. Needs bolts, not wing nuts. "Looks great and worked well at first." "I thought this device would hold the pan into the bracket, so my dog couldn't dump her food. But in less than 1 minute she had it out of the bracket and was playing with the pan"
I thought this device would hold the pan into the bracket, so my dog couldn't dump her food. But in less than 1 minute she had it out of the bracket and was playing with the pan. I'm thinking of making some small holes in the top of the pan and trying to use zip ties to fasten it to the stainless steel frame. PS: I even mounted it so that the pan was resting on the floor of her kennel! It blows my mind how she so quickly had it out! Otherwise it's a nice bowl. Works good at first but the clamp bar very quickly comes off the bowl and breaks. Small Stainless Steel Kennel Cup with Bolt Clamp -- approx 30 oz.